Photo by Donato D'Addosio S.
Voyager of the Seas made her last stop in Bari, Italy this season before she heads west to Caribbean. In 2012, however, Bari will become the new port of embarkation for Royal Caribbean, according to Royal Caribbean Italy's General Manager John Rotondo. "To confirm the growing interest in Royal Caribbean towards the Italian market and the role very strategic city of Bari, it has been announced that next year Bari will become the port of embarkation for ships of the group, with significant benefits for tourism in the city, natural gateway to discover the beauty and culture of Puglia. " 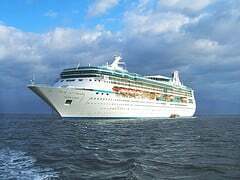 Voyager of the Seas' Adriatic cruise season has come to a close after her stop in Ravenna, Italy. Voyager of the Seas has wrapped up its inaugural season in the region, after debuting in the city of Ravenna back on May 30, culminating in 20 stops to Ravenna from May to October, for a total of nearly 77,000 passengers. 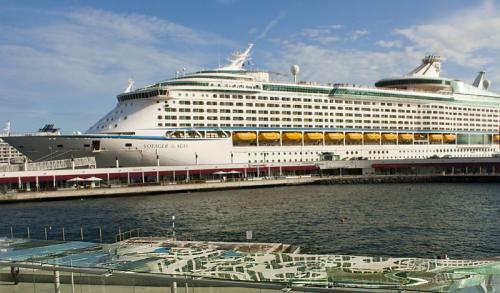 For the winter season, Voyager of the Seas will move back to the Caribbean from November to March 2012, where she will do 7-night itineraries. 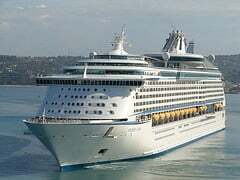 Royal Caribbean will also debut another ship in 2012, Serenade of the Seas between May to October 2012 and will stop in Ravenna five times during her 12-night itineraries in Spain, Italy and Croatia. To celebrate Royal Caribbean's Voyager of the Seas' arrival in New Orleans, country music sensation Martina McBride will perform aboard the mega-ship on November 19. 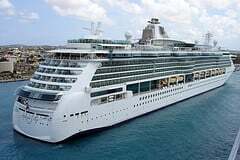 McBride will perform in Voyager of the Seas' Lyric Theatre before the ship leaves New Orleans for a Western Caribbean sailing. Royal Caribbean noted that seating for the concert is only available to invited guests. Royal Caribbean spokesman Harry Liu explained why the concert will be limited, "We wish we could invite everyone to join us in celebrating Royal Caribbean's return to New Orleans. Seating, however, is limited in Voyager of the Seas' Lyric Theater, so select-status guests of the Nov. 19 sailing and non-sailing VIPs will have priority to tickets for Martina's performance." The City of New Orleans has been hard at work refurbishing and expanding its Julia Street Cruise Terminal so that New Orleans can put itself back on the map as a cruise line hub and give The Crescent City a shot in the arm after Hurricane Katrina decimated the cruise business here. The good news is officials working on the project expect the work to be complete just in time to welcome Royal Caribbean's Voyager of the Seas. Port of New Orleans spokesman Chris Bonura is excited to welcome one of Royal Caribbean's massive liners to New Orleans, "It's the largest ship that we've ever home-ported here in New Orleans. It's 1,020 feet and it holds approximately 3,110 passengers." Believe it or not, Royal Caribbean's Voyager of the Seas has been in operation for over a decade now, having debuted in November 1999 and Jackie Roseboom wrote about how well the Voyager Class namesake has held up over the years. Voyager of the Seas was a real catalyst for Royal Caribbean as Roseboom points out, "It spawned an unprecedented building boom in new, large cruise ship construction – five other Royal Caribbean fleet mates alone are larger today." Of course, there's still plenty to do on Voyager of the Seas from ice skating, to shopping, to great specialty restaurants. Even though the ship may be over 10 years old, it's still a crown jewel in Royal Caribbean's fleet. 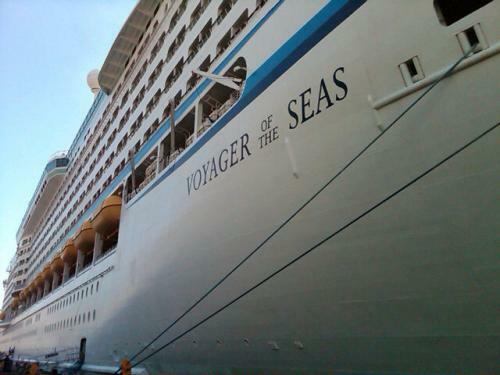 Robin Robinson posted a summary of the excursions on Royal Caribbean's Voyager of the Seas Adriatic Sea itinerary. This cruise itinerary is a departure from the traditional Mediterranean cruises most people consider so Robinson decided to see what it was like. A peek into a medieval town, Koper and nearby Piran offer an authentic look at these seaside villages. Famous for its mosaics and World Heritage sites, Ravenna has a lot to offer from historical sites to Royal Caribbean's Racing Legends shore excursion, this tour also visits the Ferrari Museum in nearby Modena. Royal Caribbean offers an overnight stay in Venice so you can experience this historic city by day and by night.